Remember that part of Greek mythology where Perseus has a dance off to end the tyranny of pop music? Or how about the part where he dons a Darth Vader helmet and a lightsaber to bring down rock and roll? No? Well, developer A Crowd of Monsters remembers, and they have just the Xbox One downloadable title to refresh your memory. As the afro-wearing Persues himself, you are tasked by Zeus to defeat the three Music Titans (each in control of Pop, Rap, and Rock). Using your powerful Funk-Fu, you progress from stage to stage, collecting records and fending off monsters in your quest to square off against the mythical creature that awaits you at the end. It all sounds like the kind of insanity you’d expect to find in a game like Brutal Legend, though sadly the humor stops there. 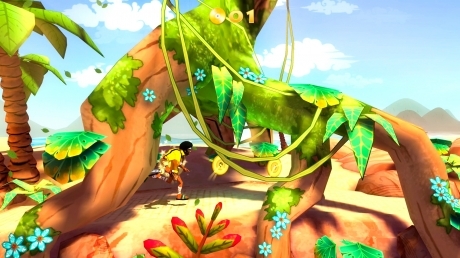 Funk of Titans falls within the same class of platformers as games like Runner2, where your character continuously runs from left to right non-stop. You can jump with A, hack enemies with your sword using X, and let out random one-liners with the analog stick. If you run towards a dead end though, Perseus will turn around, so you aren’t necessarily always moving in one direction. 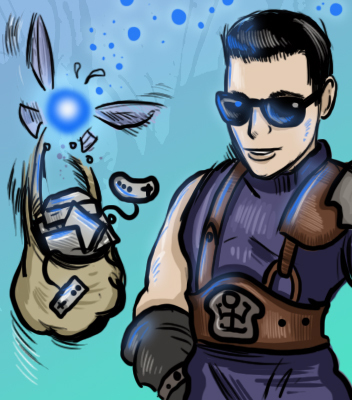 Plus, he also has the ability to wall jump, though the timing can be tricky. If you manage to plow headlong into something that hurts you, Perseus’ armor will break off and getting hit again will lead to Game Over. While the game as a whole is not that difficult, it can be needlessly frustrating. There are numerous instances where getting hit by something will send you into another hazard and you’ll instantly fail the stage. Since there are no checkpoints, even the most minor mistake will have you playing a level from the very beginning over again. 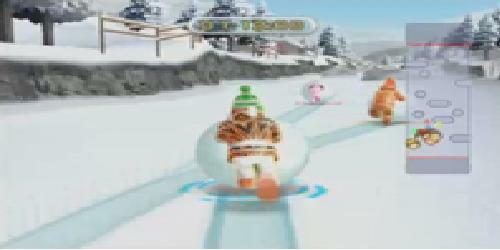 That being said, the controls are otherwise very responsive. Even if you like to hammer on the X button to attack like I do, Perseus reacts accordingly and even his jump mechanics are very tight. In fact, it’s this core game that makes the game worth playing, as there isn’t too much else on the system like it (even the aforementioned Runner2 hasn’t gotten an Xbox One release yet). 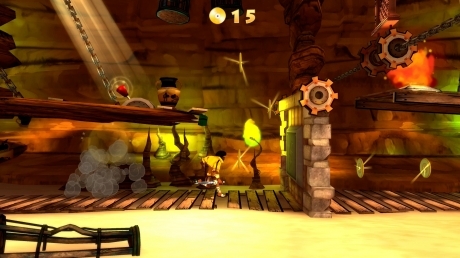 And the game’s 40 stages are short and varied enough that you won’t tire of them quickly. 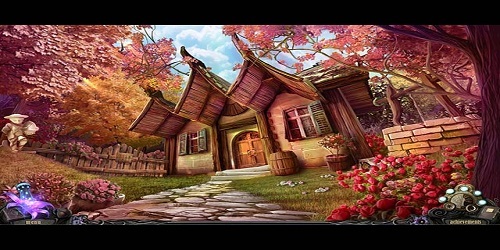 Occasionally, you’ll encounter “boss” stages that are effectively one big active time event. The ones that you need to surmount halfway through a given world are one-on-one duels where you input a string of buttons until Perseus wins the fight. Given the setting, these seem out of place and the animation seems to be identical each time you do them. A similar thing happens when you encounter the Music Titans at the end, though these at least make a bit more sense as they’re effectively a dance off. However, the music and animation that plays during Perseus’ bits are identical each time. The button presses are somewhat timed to the music though, so you at least feel as though you’ll playing a rhythm game, but it still needs some tweaking. Gold records are effectively the form of currency this game uses, and they are collected during each stage you run through. If you manage to get them all, make it to the end without getting hit, and find Pegasus in a stage, you’ll earn bonuses. Plus, finding Pegasus will allow you to play a minigame where you ride him through stages built on iPods and cheeseburgers (not making this up) to collect more records. Pegasus is represented in this game as a horsehead on a stick propelled with a rocket pack, and he too will move automatically with your only course of control being to add throttle to move up or down. Zeus has a selection of tasks for you to perform as you navigate the various stages and completing them will level up Perseus. Level ups don’t seem to have a noticeable affect on gameplay other than unlocking new things for him to buy, which is what the record currency is for. New weapons, like flaming swords and giant corn cobs can be purchased, and depending on what you carry with you, new routes may be unlocked. You can also purchase new head pieces for Perseus, such as an Optimus Prime helmet or Jason Voorhees mask, though these are purely cosmetic. The presentation is actually not bad considering the low budget nature of this production. Characters animate well, there doesn’t appear to be any technical issues that I’ve noticed, and the few voiceovers I’ve heard are rather amusing. I was a bit perplexed that the soundtrack didn’t match the world that you were currently in (nor did it really change much at all, for that matter). Still, the $8.99 price tag isn’t too shabby, especially considering I’ve seen much less production value for far more money. While it’s not going to light the world on fire, Funk of Titans is still an incredibly solid platformer and very competent for the developer’s first console release. The mechanics are sound, the gameplay is entertaining, and it’s a fun idea. On the other hand, there is so much more that could have been done with the idea in terms of humor, plus the active time event stages aren’t very well thought out. Still, if you’re looking for a way to spend an afternoon, there’s worse things you could be doing. Funk of Titans casts you in the role of Perseus, as he uses the power of Funk to take down the realms of Pop, Rap, and Rock. Your character is constantly on the run and it’s up to you to time your attacks and button presses in such a way that he makes it to the end safely. The gameplay is solid, but some aspects, like the active time events, either needed to be tweaked or discarded entirely. There’s also a level of frustration involved as you get ping ponged to death with one wrong move and forced to start the stage over. And let’s not forget the lost potential of the silly premise. 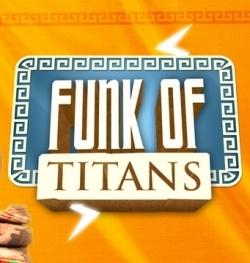 Still, if you’re looking for an entertaining indie game with a short shelf life, Funk of Titans fits the bill.